On Wednesday, September 22, 2010, General Counsel Cameron Kerry testified before the Senate Committee on the Judiciary. The Committee is holding a hearing on "The Electronic Communications Privacy Act: Promoting Security and Protecting Privacy in the Digital Age." General Counsel Kerry appeared on a panel with Associate Deputy Attorney General James A. Baker from the Department of Justice. General Counsel Kerry’s testimony reflects the work of the Department of Commerce Internet Policy Task Force on data privacy, cybersecurity, and other issues affecting the digital economy in the 21st Century. 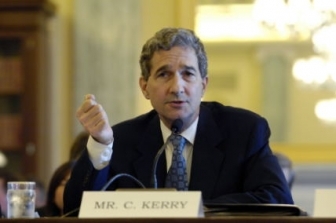 General Counsel Kerry’s testimony reflects the work of the Department of Commerce Internet Policy Task Force on data privacy, cybersecurity, and other issues affecting the digital economy in the 21st Century. The testimony discussed changes in the digital landscape since the Electronic Communications Privacy Act was enacted in 1986, especially in cloud computing, mobile phones, and location services. Here is link to his prepared testimony (PDF).